Age: 21 (22 in Project D) Car: Mazda RX-7 Type R (FD3S) (color: Competition Yellow Mica) Likes: His beloved FD Dislikes: 4WD, Overdressed schoolgirls, Gyaru & losing. Keisuke Takahashi is the number two driver for the Red Suns. Keisuke drives FD3S and is a skilled driver, second only to his brother. Keisuke is a rather hot-headed young man and does not like losing. 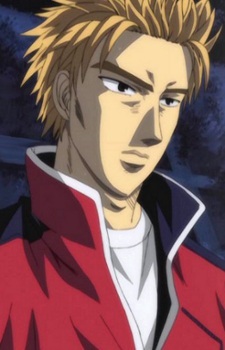 Keisuke is also known to drive with his emotions, for example if he realises that he cannot win his driving suffers and if he is in the lead he is carefree and much relaxed. Before Ryousuke got Keisuke involved in street racing he was the leader of a Bosozoku gang. He joins his brother's new team and has a rivalry with Takumi. Keisuke races the Hillclimb (Uphill) on most races, while Takumi races the downhill. Keisuke isn't analytical like his older brother, and Ryousuke's ability to compute and analyze amazes Keisuke. But at the same time, Keisuke's ability to think less while he is driving, and to do only what he feels amazes Ryosuke. While Ryousuke has decided that he won't race much longer, and that he will become a doctor in the future, Keisuke has dedicated his life to racing, his eventual goal is to become a professional racer. But first he must defeat Takumi. Though visibly getting along, they still have some kind of argumentation over who is the ace, he has respect for Takumi. He stated once he was not as strong minded as Takumi, because Takumi fell asleep really fast before a great battle, making him ask himself if he knew what was pressure.